Did you know one easy way to take a couple of seconds of your time is to push off the wall in a streamline position? Pushing off the wall with your arms apart already starting your stroke (or sometimes not even pushing off the wall at all) doesn’t give you any boost or any advantage at the start of your lap. Instead of pushing off with streamline arms will give you that extra boost before you even need to start swimming! If done well at both pool ends you can take a couple of seconds off your 100m time. 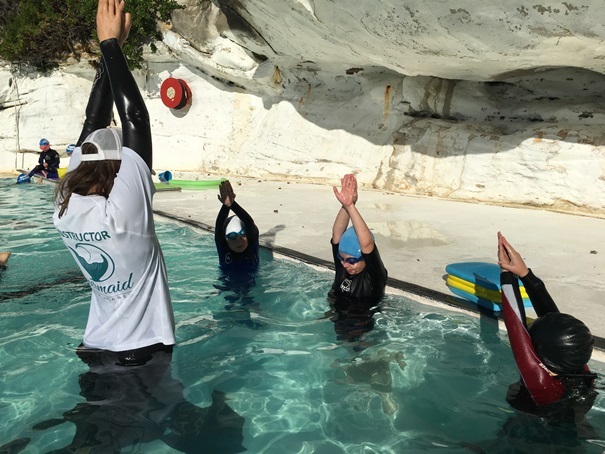 To do a great streamline off the wall you should have one hand on top of the other with your arms squeezing your ears or even the back of your head if you are really flexible. Your head should be tucked under with your chin almost on your chest. This will ensure you are in the best position to glide underwater for as far as possible with the least resistance. Once you master this you can add some dolphin/butterfly kicks to help you get up to the surface of the water. If you have ever wondered how Olympic swimmers get so far underwater at the start of their race and at their turns – this is how! A strong push off underwater, with streamline arms and dolphin kicks – easy! Watch this video of Katie showing how it’s done.